How to Book SKI and SNOWBOARD rental/lessons in Bansko. How to check WEBSITE PRICES ? Have a look the FORM at the right! If you use your smart phone, FORM is located at the bottom of each page. Please fill in the form your first day. Set a Valid date from the winter season from December 6 until April 4. 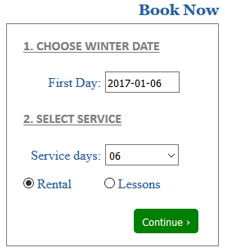 Choose service: Rental or Lessons. Please fill correct the RESERVATION FORM. Prices for Equipment and how to book. Have a look sub menu! Choice of equipment - SKI rent | BOARD rent. We offer the equipment in three age groups: children up to 12 ages, teenagers from 13 to 17 ages and adults over 18 ages. You can select a specific article/s or full equipment - just click above the image of article. If you need more than one equipment with Quantity (QTY) you can select. How to book ski or snowboard lesson/s?. SKI rent | BOARD rent | LESSONS. SKI, SNB - SNOWBOARD or CROSS country ski lesson. - how many hours per day you want. - number of people you are. We organize open Group lessons with minimum 3 customers same level and the limit of the group is 10 customers. If you are two or few people same or similar level and you want to be together with one instructor you can book Private lessons for your group. If you are alone you can book Private lessons only for you.